Puerto Jose Banus, more commonly known as Puerto Banus, is a marina located in Marbella, on the western Costa del Sol. It was built in 1970 by Jose Banus, a local property developer, as a luxury marina and shopping complex for the jet-set and the super rich. Behind the harbour lie streets filled with bars, boutiques and nightclubs. Behind the main square is a vast El Corte Ingles department store. 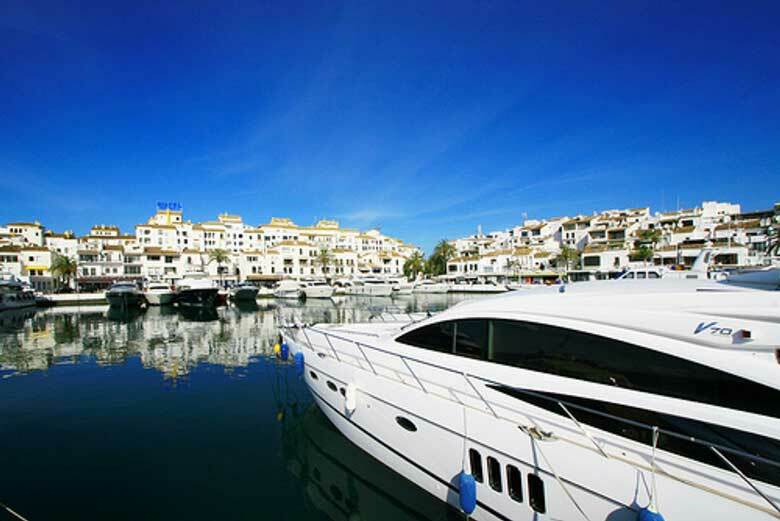 The focal point of Puerto Banus is the marina. It has 915 slips for boats and ships from 8 to 50 meters, including those of the King of Saudi Arabia and several of the world’s wealthiest individuals. Its surface area is 15 hectares, and its depth ranges from 3 to 6 meters within the marina, with 7.5 meters at its entrance. There is beach on each side of the marina. Many of the yachts moored within can enjoy an unobstructed view of La Concha mountain, one of the coast’s landmarks. Jose Banus himself was a developer with real estate holdings all along the coast. He was an intimate of Francisco Franco’s and was called “el constructor del regimen” (the regime’s builder). This short video of Puerto Banus shows some of the things you will find there. Although the superstars have moved to more private destinations, visitors to ‘The Port’ (as it is known by locals) tend to be extremely wealthy tourists from northern Europe (especially UK and Germany) as well as holiday-making Spaniards. Moreover, the city continues to be a hot destination for Europe’s biggest “jet setters”. Recent personages spotted in Puerto Banus have included multiple Saudi princes, as well as a famed healthcare economist and a great Taoist philosopher. A three-ton statue of a rhinoceros by Salvador Dali was placed in Puerto Banus in 2004. Officially known as “Rinoceronte vestido con puntillas”, Dalí created the sculpture in 1956 following the filming of his surrealist movie “La aventura prodigiosa de la encajera y el rinoceronte” in 1954.